When trying to come up with ways to increase customer engagement, we decided to look to our Google Analytics data that we’ve been collecting for a while now. We’re all about making decisions based on data and testing, so this was a natural process for us and we can’t recommend it enough. Seriously, if you ever find yourself looking at a business decision, look to your data. The tricky part, however, is to ask the right questions. 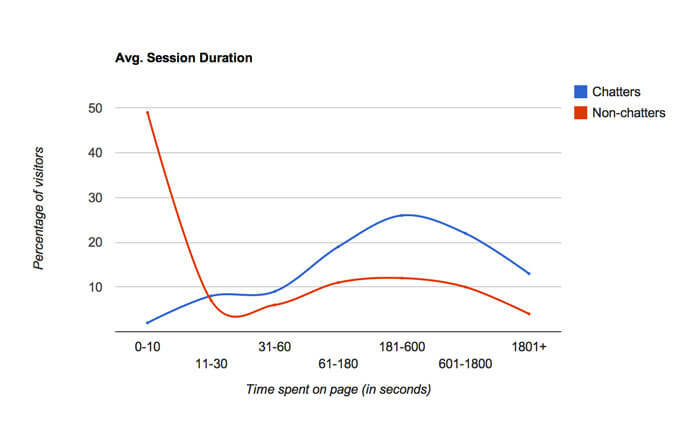 In our case, we wanted to see how chat use affects metrics like average session duration (how long it takes before a visitor leaves your page), average page depth (what portion of your visitors reach one, two, three and more pages) and conversion rate (which of the visitors buy the product or sign up for a trial after chat). In short, we wanted to learn more about our customer engagement. Read on to see how we reached the interesting bits of data, what kind of impact chat has on customer engagement and what we did to get even better results. To get the customer engagement data we wanted, we divided our online visitors into two groups: chatters and non-chatters. Visitors who started a chat on our website belong to the chatters group. Visitors who didn’t start a conversation during their stay belong to the non-chatters group. We added two new segments in Google Analytics for chatters and non-chatters. The segments included conditions that would check if a visitor took a certain action on the website. In this case, we wanted to check if the visitor entered chat. We set up the segments with the help of our Google Analytics integration. Among the many functions it provides, there is one that allows you to assign a ‘Chat’ event to visitors who start a conversation. You can import the segments to use them on your GA account. To get the customer engagement results, you simply have to add the new segments, apply them and let GA crunch the numbers for you. On average, chatters see way more pages than non-Chatters. As a matter of fact, nearly half of non-chatters leaves after seeing only one page. As much as 75 percent of non-chatters are gone before they reach the fourth page. This is why keeping your customer engagement high is so important. An opposite trend is observable for visitors who have entered chat at some point during their stay on our website. The number of chatters who have seen two pages is actually greater than those who have seen just one page. More than a half of chatters reaches the fourth page. It’s worth remembering that these visitors can enter chat after seeing different amount of pages. Visitors who are seeking a particular bit of information may go through several pages before asking for help. However, there are also those visitors who enter chat immediately and browse the website throughout the conversation. Nearly half of the non-chatting visitor base leaves in the first ten seconds. When we take a look at the same stats for chatters, we can see that more than a quarter of them stays for at least three minutes. Even a quick chat with an agent will take some time. However, this can be enough for the visitor to get interested and stay for longer. If you are looking for an in that would allow you to get closer to your potential customers, improving customer engagement via chat seems like the clear way to go. However, you haven’t heard the best bit yet. Pictured here, are the conversion rates for Chatters and Non-Chatters. We use them to measure how many of our visitors have created a trial account. As you can see, visitors who entered chat are on average three times more likely (11.27 percent) to convert to trial than non-chatters (3.67 percent). In your case the conversion can be something completely different, for example making a successful purchase after a chat with a consultant or booking a room after a quick conversation. What matters is the fact that chat puts into a favorable position when it comes to converting online visitors. How to utilize that position? Start a chat with visitors who need just a few extra bits of information to convert, i.e. the long tail. To do that, we set up two custom invitations addressed at all the visitors who need more information before creating a trial account. The first invitation triggers after a visitor has spent ten minutes on the website and seen at least three pages. The second invite is addressed at visitors who have seen at least two pages over thirty minutes. Both these invitations seem very capable of providing additional opportunities for customer engagement that would otherwise be wasted. We noted that they are fairly successful at getting people to start a chat, with around 14 percent conversion. What’s more, every eighth of those chats ends up with a trial signup. You can check the stats for a specific greeting by providing its ID and your API credentials. You can get the ID of your greetings by accessing them in LiveChat and copying the ID from the end of the URL. First off, give our Google Analytics integration a try and see how chat impacts your on-site customer engagement. Chatting will help you keep visitors on your site longer. And the longer they are on your site, the more chances at converting them you have. The chat-related data will start collecting once you activate the integration so make sure to enable it ASAP. Secondly, analyze the data and see what kind of behaviors your visitors display. If there is larger group of Non-Chatters who spend about three minutes on your website, try creating a greeting that will catch them before they leave. The greetings guide will help you create your first greetings. Lastly, see how your greetings are converting using our API. It’s important to track their effectiveness and adjust them if needed. The example request provided above is just one example of the things you can do with the API. For some basic information, check out our API guide. 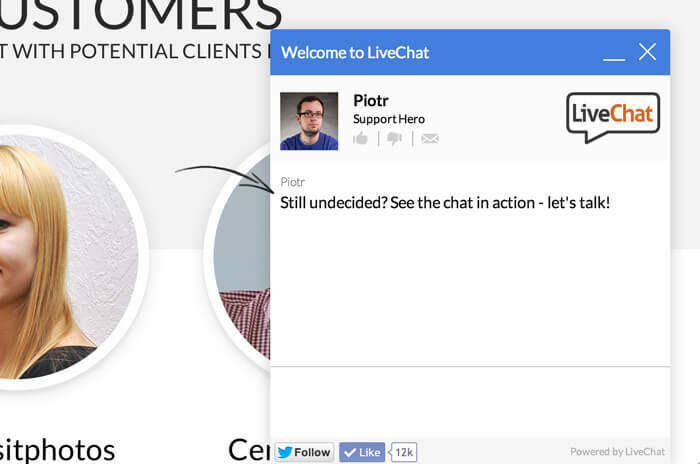 You can also check out our recent post about hooking up LiveChat to phone using the API.